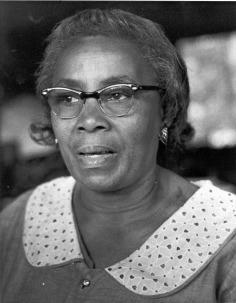 Septima Poinsette Clark (May 3, 1898–December 15, 1987) was an American educator and civil rights activist. Clark developed the literacy and citizenship workshops that played an important role in the drive for voting rights and civil rights for African Americans in the American Civil Rights Movement. Septima Clark's work was commonly under appreciated by Southern male activists. She became known as the "Queen mother" or "Grandmother" of the American Civil Rights Movement in the United States. Martin Luther King, Jr. commonly referred to Clark as "The Mother of the Movement". Clark's argument for her position in the Civil Rights Movement was one that claimed "knowledge could empower marginalized groups in ways that formal legal equality couldn't." ^ Alpha Kappa Alpha Sorority, Inc.
She settled in Columbia, South Carolina in 1929, and accepted a teaching position that year. In total, it appears that Septima Clark spent a total of 17 years in Columbia, South Carolina. Much of her work there is documented by the University of South Carolina History Department which, under the direction of Dr. B. J. Donaldson, has conducted extensive research on African American education, with special emphasis on the history of the Booker T. Washington High School. In 1929, Septima Clark was employed at Booker T. Washington where she is still remembered as an outstanding educator. She worked closely with the principals of Booker T. Washington High School, both C. A. Johnson who recruited her for the teaching position she would hold for 17 years and later with J. Andrew Simmons, who was originally from Charleston and whom she may have known previous to their working together in Columbia. While in Columbia, Septima Clark completed the foundations upon which her career, reputation, and memory would rest: she became a highly valued faculty member at Booker T. Washington High School, she completed her Bachelor's degree at Columbia's Benedict College, and she completed her graduate studies at New York's Columbia University and Atlanta's Clark College. The level and quality of the education that Septima Clark achieved was typical of what was required by the administrators of the Booker T. Washington High School of Columbia who recruited highly trained teachers from all over the country. After J. Andrew Simmons left Booker T. Washington High School to take a position in New York in 1945, Septima Clark stayed on for two additional years, before finally leaving Booker T. Washington High School, an institution she had helped to mold, in order to return to Charleston, SC to take care of her ailing mother, Victoria. While teaching at Avery from 1919-1920, Clark met Nerie David Clark. He worked as a warden cook on a submarine in the navy during WWI. In late 1920, she went to teach in McClellanville until 1922. She and Nerie wrote letters back and forth and dated for approximately three years and got married in 1923. They got married in McClellanville and then shortly moved to Hickory, North Carolina, Nerie's hometown. Clark's mother was disgraced by her marriage. Victoria believed to marry any man outside of the state is to marry a stranger. She refused to have her in-laws for dinner or for any occasion. The marriage severed Victoria and Septima's relationship. While living in Hickory with Nerie's family, Clark became aware of the many cultural and ideal differences they had. They grew up in different worlds; a mountain man and a low-country girl. In Hickory, Clark attended the church Nerie's family did, which was an African Methodist church. She found this church to be much more of a community than her church in Charleston, the United Methodist Church. Throughout Clark's religious journey in life, she found there are many ways to serve God, rather than only one correct way. Clark got homesick, so they moved back to Charleston, where she taught at Promise Land again from 1926-1929. In Charleston, they had their first child, which died. Clark viewed the death of her baby as a punishment to her because she married a man not from South Carolina. Her mother was not sympathetic and refused to help her; however, her father was friendlier towards her. To get over her lost baby, she took a job with a white woman for a summer. They stayed in the mountains for the summer and the woman was helpless, which gave Clark optimism and hope. She then moved to Columbia and began teaching in 1929. It was in Columbia she got much more involved in civic activities. Clark first heard of the NAACP while she was teaching on John's Island from 1916-1919. There was no NAACP chapter on John's Island, but a meeting was held in which various preachers came and spoke about what the NAACP was and what exactly it was trying to do. The superintendent was in attendance to collect dues and it was then that she decided to join the organization. In 1919, Clark returned to Charleston to teach sixth grade at Avery Normal Institute, a private academy for black children. In Charleston, she joined the Charleston Branch of the NAACP and began attending meetings regularly of the National Association for the Advancement of Colored People (NAACP). Under the guidance of Edmund Austin, the President of the local NAACP in Charleston, Clark took part in her first political action with the NAACP in Charleston. Despite the orders of her principal, Clark led her students around the city, going door-to-door, asking for signatures on a petition to allow black principals at Avery. She got 10,000 signatures in a day's time and in 1920 black teachers were permitted. In 1920, Clark enjoyed the first of many legal victories when blacks were given the right to become principals in Charleston's public schools, under the education board of Alderman of Charleston. Her participation in the NAACP was Clark's first statement in political action. Clark remembers only ever being punished by her father when she did not want to attend school; however, Clark's father was not able to write his own name until the later years of his life. Victoria raised her children separated, with the boys having more lenient rules than the girls. The boys could have friends over and play many days of the week, but the girls had to do chores and lessons, every day other than Friday. Clark rebelled against her mother's strictness through never becoming the lady she wished her to be and marrying a man Victoria called a "stranger". Victoria Warren Anderson Poinsette lived in a constant struggle of wanting to improve her social class; she wanted to live in a middle-class society, but on a working-class budget. Victoria made it well aware to Peter that he was not providing enough for her and their family. She returned to Charleston after the Civil War and worked as a launderer. She raised her children very strictly, only permitting them to play with other children on one day of the week. She was also determined to make her daughters into ladies, so she told them never to go out without gloves on, never yell, never eat on the street, etc. by her brother, who took her and her two sisters there in 1864. Victoria Poinsette had never been a slave, and vowed to never be anyone's servant.Haiti Her mother, Victoria Warren Anderson Poinsette, was born in Charleston but raised in  Peter was a house servant to Joel and his main task was taking the children to and from school each day. After slavery, Peter found a job working on a ship in the Charleston harbor. During one of his travels, he went to Haiti and it was then that Peter met Victoria, Clark's mother. The couple got married in Jacksonville, Florida and then moved back to Charleston.